Global Humanities has been published biannually. Nowadays religions are especially important for those who are living in countries of the formerly so-called ‘Third World’. The miseries of life seem to be so hard that just an afterlife in a transcendent paradise is promising relief. Consequently, there seems to be a close connection between religion and poverty, especially in the 21st century, when the hope for a better afterlife has become a driving force of the poor population of the world. However, what could be interpreted as a proof of the Marxist doctrine of religion as opium of the people, for sure deserves a more multiperspectival approach, which would not just cover the recent years of human history, but past centuries as well as the different religions around the globe. 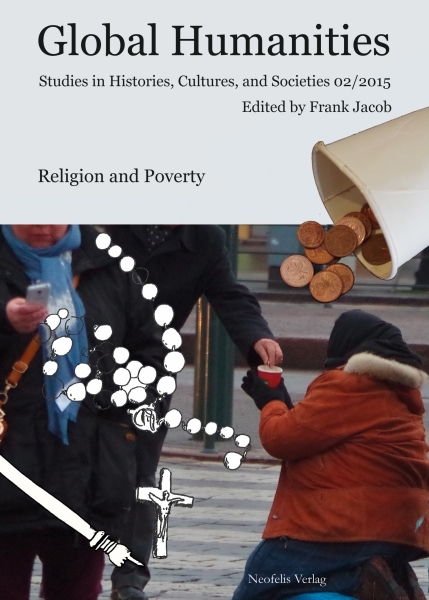 Therefore the second issue of Global Humanities traces the interrelationship between religion and poverty not only from a historical, but also from a sociological, religious and artistic perspective. Mit Beiträgen von Benjamin Beit-Hallahmi, Waleed Chellan, Logan Cochrane, Divya Kannan, Alvin Lim, Atara Moscovich, Sabine Müller und Jeremiah Unterman.